If you’re looking for a place to unplug, unwind and experience the purity of life, look no further than a luxury yoga retreat. From the blue Aegean Sea to the tropical rain forests of Indonesia, the true yogic design and culture of these retreats promise to give you an unimaginable yoga experience. Time to reconnect with your inner goddess… here are Elite Traveler’s top picks. Ananda is nestled in the Himalayas, overlooking the holy city of Rishikesh and the beautiful Ganga River Valley. The luxurious Northern India resort has an array of yoga packages for you to choose from, as well as, the opportunity to talk to one of their residential experts for a bespoke yoga experience tailored to you. With a focus on the traditional and meditational elements of yoga, their yoga classes incorporate all aspects of the mind, body and spirit, ensuring balance and rejuvenation upon your departure. Packages start from five to seven nights ranging from yoga detox to a more traditional flow, focusing on Hatha, Raja and Kriya yoga. Villa Stephanie at Brenners Park Hotel & Spa is among Europe’s best wellness retreats. And while yoga isn’t the only mainstay at the center, it’s certainly one of the many options for yogis looking to heal their mind and body. The Absolute Sanctuary in Thailand is a haven for yogis. The retreat offers up to 25 yoga classes a week and allows guests to have freedom to choose if and when they go. Yoga flows range from Vinyasa to Ashtanga and Hatha to Pranayama, so you’ll never be bored! Their yoga studio delivers the most beautiful panoramic views of the ocean so you get the best of both worlds, yoga and sea. Their detox kitchen offers a delicious menu of local fresh dishes to keep you fit, balanced and full of energy during your stay. Seven day programs include two fresh juices a day, massages, colon hydrotherapy and full access to the steam room, pool and fitness studios. Detoxing at its best. Holistic therapy, yoga, diving and world class cuisine is what you’ll get at this luxury yoga retreat. Como Parrot Cay is a Caribbean island resort in Turks and Caicos, a secluded resort with its own array of private and pristine beaches. An archipelago of eight islands and more than 40 cays make up this breathtaking paradise, so it comes at little surprise that the world’s best yoga instructors flock here to teach, including Elena Brower and Erich Schiffmann. As part of their 5-star luxury retreat, the Como offers six complimentary yoga classes a day, healthy dishes and a full menu of Ayurveda treatments to take your pick from. If Latin culture is more your thing, you won’t be able to pass up a yogi visit to Costa Rica’s Blue Osa. The stunningly decked out retreat offers guests sea views and expert yoga teachers, who travel there especially for its bespoke teak yoga studio and natural beauty. 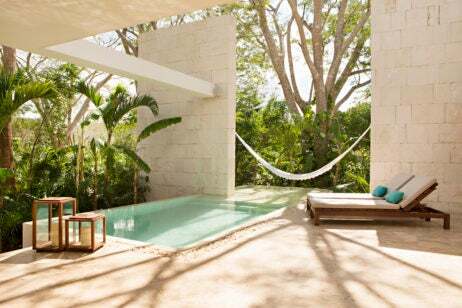 Yoga lovers are welcomed to year-round yoga retreats, which include farm-to-table meals, miles of secluded beach and full access to the Blue Osa Eco Spa. Their chemical free solar powered pool is not the only facility built with love and mindfulness at the resort. The entire establishment was built from scratch with a passion for living green and as chemical-free as possible. Their mission? To nourish the body, mind and spirit. This private-island yoga retreat has everything you need to leave the modern world behind. Set in the beautiful Greek island of Oreoi, guests are invited to practice yoga twice a day, as well as, meditate and journal their thoughts. The locally sourced food is vegetarian, providing you with the healthiest and tastiest of Mediterranean vegetables Greece has to offer. Traditional styles of yoga such as Hatha and Vinyasa are offered as well as more restorative, Yin style flows. Depending on the retreat, the focus may vary from meditational to Ayurvedic themes, the choice is entirely up to you. Whether sea lovers want to go kayaking to meet the local seals and dolphins or if creatives want to try their hand at painting, there’s something for everyone at Silver Island. Bali is the world’s leading destination for yoga – it wouldn’t be right to leave it out. This one particularly stands out for us. Bagus Jati, located in the middle of Bali’s tropical rain forest promises guests a peaceful sanctuary with only exotic birds and fluttering butterflies to be heard during their stay. Their yoga retreats run from three to five nights including one yoga class a day, private yoga lessons, fresh meals and vegetable juices and customized Ayurvedic treatments. An open air yoga studio is terraced amid the jungle giving guests full view of the magical rain forest and the rare opportunity to be one with nature.